Expandable - customize to your needs! This expandable surfboard ceiling rack is the ideal choice for overhead storage of your surfboard(s). Excellent way to store your surfboards out of the way and utilize ceiling space that is often empty. The ceiling rack stores your surfboards in the horizontal position with easy access. The support arms feature lifted tips that ensure that once you put your surfboard in the rack it will not slip out. The innovative design feature of this rack is that it is expandable to fit multiple surfboards in an extremely compact and easily accessible design. You MUST first start with the “Base Rack” (Shown below). Then you can add on as many “rungs” as you need. Select this in the options drop down menu above. You can also select an “Add-on Rung” for SUP boards. We also offer this rack as a SUP expandable ceiling rack. The difference is that the SUP ceiling rack comes with a larger base rack that can fit SUP boards. This Surfboard Ceiling rack can be equipped with SUP Add-A-Rack Rungs (choose from above). Already have the base rack and just want an expansion section? Check out the expansion rack. We have a 6" beam that runs 11 feet across the width of our garage. Do you have a rack that would work for us if we wanted to store our boards parallel to but underneath the 6 inch beam? Look like your base is 14" wide so don't think that would attach very well to the 6" beam. To store your boards parallel and underneath your 6" beam, we do have something. This ceiling rack has mounting holes that are 4" apart, so you could mount it on your beam such that the boards run parallel to the beam. How many base racks & add a racks do I need for two surf boards ? 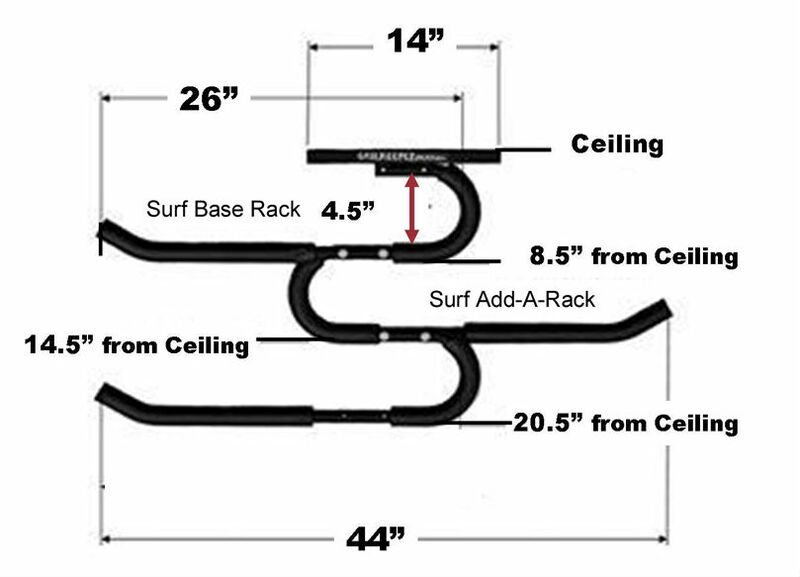 To store two surfboards using this ceiling rack, you would only need to order the "base rack + one surfboard extension level" option. The base surfboard rack will hold one of your boards, then the extension level will hold the second one. You can find that order option in the drop-down menu when you add this rack system to your shopping cart. What comes in the box? Just the base or a base and extension arm? During checkout, you choose what components you need for our expandable rack system under "rack configuration." You will need to start with a base rack - the base rack will hold one board, so if you just need to store the one surfboard, that is all you would need to order (the base surf rack), and then that, and mounting hardware, is what you would receive in the box. If you want up to two more levels to add-on to the base, you would order the base surf rack and add one or two levels, and you can order those levels for SUPs and/or additional surfboards. You'll see those options in "rack configuration" during checkout. Note, there is a base rack that is larger if the base support level you want will hold a SUP, that can be seen here. If I am hanging them indoors do I need to be able to locate a beam? Yes, to mount a Surfboard & Stand-Up PaddleBoard Ceiling Rack, you must locate a ceiling beam, there isn't a work around for installing ceiling racks. If your beams are covered, you find them the same way you would find wall studs. We have some additional installation guidelines and tips for reference here. How is the first rack connected to the mounting bracket? You can choose whether you need the Surf or SUP sized expansion level (SUP being bigger) from the options at that link. Note, the system can support up to 3 levels total, which includes the base level. Using for a paddleboard (bottom tier) and windsurf board (top tier). The tube arms, especially for the paddleboard, really deflecting down under the weight of the paddleboard. The weights are all within spec guidelines. Hopefully, the deflection stays as-is over time and doesn't bend further or break over time. Rack protects board well. Wish there was a rubber cover for the mounting screws, just in case the board hits it. The only major complaint is that the mounting holes are only 12" apart which doesn't allow for stable mounting on a standard 16" frame. As long as the center hole is used to mount the rack, the unused hole will lever up due to the weight of the board and compress against the ceiling. My opinion, if in a stud, only the center screw is needed. Exactly what I needed. Boards fit nicely and safely above the rest of the garage. Good quality, look nice. Very pleased. The rack came relatively quickly, was really easy to install and works great. looking forward to buying more boards to take advantage of the expandability. I store two surfboards and a standup paddle board on the rack. . Also can hang wetsuits and other stuff from the rack. It's mounted in the middle of a crowded garage, but it's easy to load and unload boards.